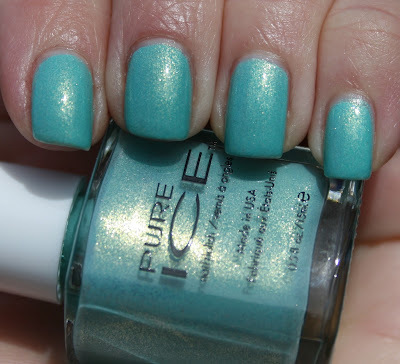 Today I have another one of the Pure Ice Fairytale Forest collection shades that I found at Walmart on an end cap before Christmas. I tried to find them all, but even after trying 3 different stores, I only ended up with 6 of the 8. The Nail Tales has a great post showing all 8 shades. Precious Jewel is an aqua creme that has a shimmer than leans gold on me. I got great coverage in just two coats. Well, this is a pretty one indeed. I love the color and finish. A must try!